I have come to the realisation this is what I am. As i don't count my albums as 'finished' I am quite happily using by new organisation method to work back and fill in gaps of stories - or photos. Which were missing from our albums. I'm pretty happy now with some of the 2007/2008 albums, but thinking to make some space I need to move this now out of the front room and somewhere else. I love the changing seasons, and this is one thing I have loved with projectlife, is being able to record this change and flow of life. For example in my album I have a large 6x12 print of M on his second birthday, I have another couple of 6x12 prints taken in the Spring at a wedding. Then a couple more taken in the summer and I have just ordered a couple more taken this Autumn in the park. The change in seasons makes me want to scrap these stories and pictures - missing from our family album was a little day out we took to Garsons Farm last year (it seems last autumn was a lot more dry and sunny than this one). This layout was very much inspired by Shimelle Laines New Class Scrapbook Remix. I have found this class, like a daily mini magazine article, with layouts, ideas, videos and was of looking at my stash (old and new). I've had this Amy Tan tag for ages! Happy that is finally on a page and in my album! 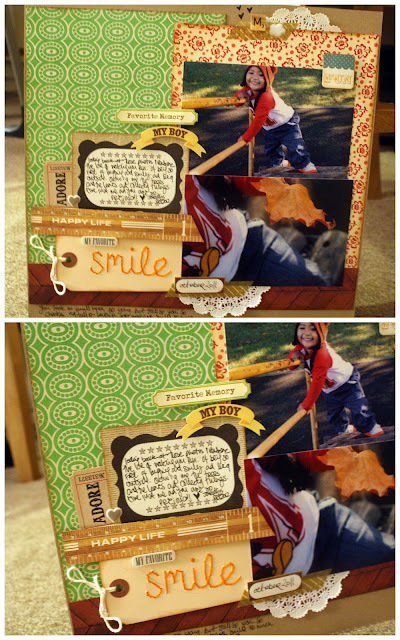 Another layout inspired by the Scrapbook Remix class. Really happy with the outcome here. Apologies for the photo here! I am having major blogger issues trying to resize photos in my blog post (the bar only appears for the first photo and the others I need to edit in HTML.) It is driving me crazy! Any tips on how I can fix this or what I am doing wrong for it not appear, greatly appreciated!. Any scrapbookers out there feel the same? I remember last year being really wet aside from a couple of days because I was so desperate to get some pictures of the children in the leaves but they were always soggy! I like to scrap in season too but I don't know why, maybe because I have Christmas stuff out to do JYC etc and I want to catch up from last year!